I think that the Marc Pro can be a helpful tool for any athlete looking for another helpful recovery or activation tool. It’s simple to use, and extremely effective. We invest so much time and money in all the other equipment and training, but sometimes the recovery aspect is overlooked, even though it’s just as important. Sometimes exercise or life can leave you aching and in need of something more for relief. 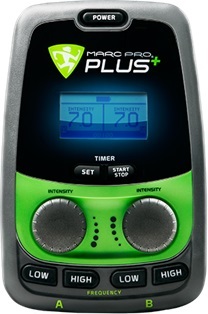 Marc Pro Plus has additional modes (frequencies) for pain relief. When moving nourishment and waste with low frequency isn’t enough the high frequency setting can calm irritated nerves.